Does spending more time researching a company’s fundamentals generate higher returns for investors? More generally, does active value investing create value? A simple test of the payoff to the "active" component of value investing is to look at the returns earned by active value investors, relative to a passive value investment option. In the figure below, I compute the excess returns generated for all US mutual funds, classifed into small cap value, mid cap value and large cap value, relative to index funds for each category. Thus, the returns on small cap value mutual funds are compared to the returns on index fund of just small cap, value stocks (low price to book and low price to earnings stocks). 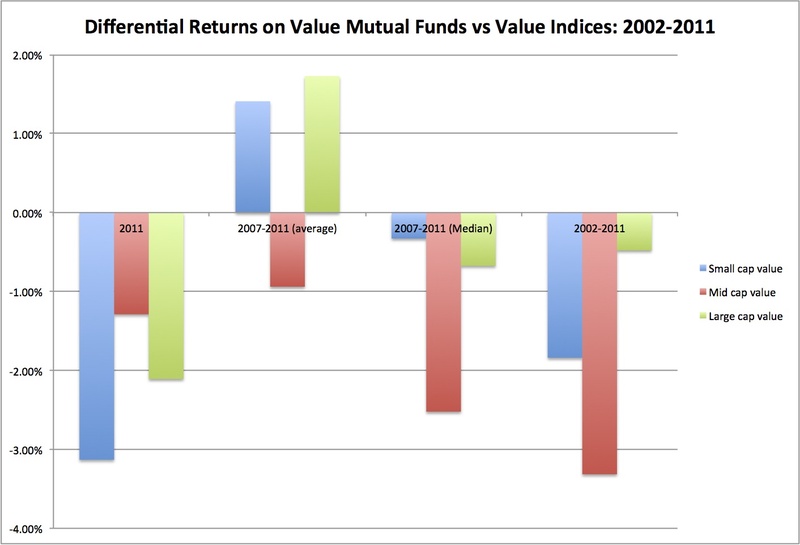 While the average returns earned by small cap and large cap value funds did beat their respective indices over a 5 year period, the active value funds underperformed the indices in every other comparison, with small cap value funds delivering almost 2% less than the small cap value index over the last ten years. These results are not due to negative returns at a few really bad funds, either, since 55% of large cap value fund managers, 64% of mid cap value fund managers and 56% of small cap value fund managers under performed their respective indices between 2002 and 2011. In fact, even over the 2007-2011 period (the most favorable period in the comparison), using the median return rather than the average return across value funds makes the excess returns negative. Lest you attribute this to the time period of the analysis, you can look at this study from 1992-2001 and this one from 1971 to 1991 to see that the findings apply over time. 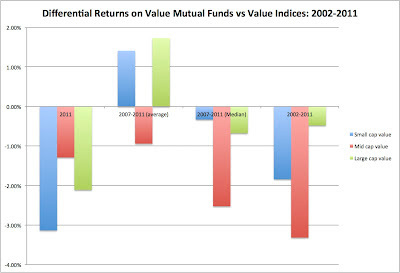 If you are an individual value investor, you may attribute this poor performance to the pressures that mutual funds managers operate under to deliver results quickly and their tendency to drift from their core philosophies, and argue that disciplined individual value investors do better. Since it is difficult to track the performance of individual investors, the question of whether individual value investors deliver better results than mutual funds has no clear empirical answer. However, there are some intriguing findings in the literature. 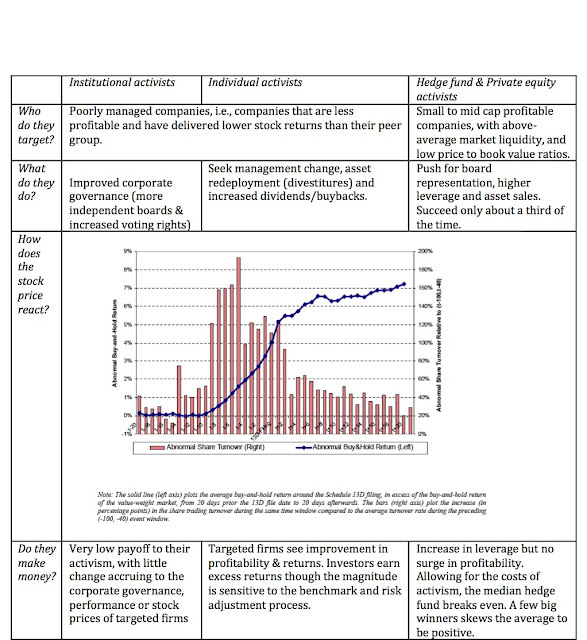 In a study of the brokerage records of a large discount brokerage service between 1991 and 1996, Barber and Odean concluded that while the average individual investor under performed the S&P 500 by about 1% and that the degree of under performance increased with trading activity, the top-performing quartile outperformed the market by about 6%. Another study of 16,668 individual trader accounts at a large discount brokerage house finds that the top 10 percent of traders in this group outperform the bottom 10 percent by about 8 percent per year over a long period. Studies of individual investors find that they generate relatively high returns when they invest in companies close to their homes compared to the stocks of distant companies, and that investors with more concentrated portfolios outperform those with more diversified portfolios. While none of these studies of individual investors classify superior investors by investment philosophy, the collective finding that these investors tend not to trade much and have concentrated portfolios can be viewed as evidence (albeit weak) that they are more likely to be value investors. Faced with this evidence, some value investors fall back on the old standby, which is that we should draw our cues from the most successful of the value investors, not the average (or the median). Arguing that value investing works because Warren Buffett and Seth Klarman have beaten the market is a sign of weaknesss, not strength. After all, every investment philosophy (including technical analysis and charting) has its winners and its losers. A more telling test would be to take the subset of value investors, who come closest to the meeting the purity standards of value investing, and see if they collectively beat the market. Have those investors who have read Ben Graham's investment tomes generated higher returns, relative to the market, than those who just watch CNBC? Do investors who trek to the Berkshire Hathaway annual meeting every year have superior track records to those who buy index funds? Core investment philosophy: A good value investor has a well thought through view of how markets work and how they correct themselves, honed not only through experience but backed up with empirical evidence. Competitive edge: At the risk of repeating myself, you do need a competitive edge to succeed over the long term. Since that edge can no longer be access to data or analytical tools (both of which have been democratized), it may have to come from you having a longer time horizon, a lower need for liquidity or a different tax status than the typical investor. It could also come from your capacity to deal with information overload or use information across different markets (globally and in terms of asset classes) better than the typical investor. Discipline: If there is a finding that studies have in common, it is that too much activity, even with the best of intentions and by the smartest of investors, is damaging to portfolio returns. Having the discipline to not deviate from your core philosophy (based upon whims or emotion) seems to be a key component in long term success. Lack of hubris: There is no reason why value investors cannot borrow and adapt pieces of momentum and growth investing or even from academia to augment their returns. To do so, they have to be open to the possibility that every investment philosophy has its strengths and weaknesses, and that no group of investors has a monopoly on investment virtue (and success). This is the last in a series of posts that I have on value investing. You can read the paper that I have on value investing (see link below) and I did make many of these points in a presentation (Warning: It is a little caustic...) in Omaha this year at a value investing conference, just before the Berkshire Hathaway meeting. Blog post 5: Value Investing: Where's the beef? Nokia came out with an awful earnings report yesterday, with warnings of more bad news to come, and its stock price, not surprisingly, plummeted. While investors are fleeing the stock and a ratings downgrade looms, is it a contrarian play? What about JP Morgan Chase? Or Research in Motion? Netflix or Green Mountain Coffee, anyone? By focusing on stocks that other investors are abandoning, contrarian value investing is the "anti-lemming" strategy, but it takes a unique personality and a strong stomach to pull off successfully. The core belief that underlies contrarian investing is that investors over react to both good and bad news, pushing prices up too much on the former and down on the latter. If you carry this view to its logical conclusion, it then follows that prices will reverse in both cases as investors come to their senses. While you may believe that investor overreaction is the norm, is there evidence to back up the claim? The statistical and the psychological evidence is mixed and contradictory. On the one hand, there is significant evidence that investors under react to news stories (earnings reports, dividend announcements), leading to momentum (and drift) in stock prices, at least over short periods. On the other, there is also evidence that investors over react to information, with price reversals occurring over longer periods. In behavioral finance, as well, there are two dueling "psychological" characteristics at play: the first is that of "conservatism", where individuals, faced with new evidence, update their prior beliefs (expectations) too little, thus creating under reaction, and the second is "representativeness", where individuals over adjust their predictions, based upon new information. To reconcile the co-existence of the two, you have to bring in two factors. One is time, with under reaction dominating the short term (days, weeks, even months) and over reaction showing up in the long term (years). The other is the magnitude of the new information, with over reaction being more common after big events. Within the construct of contrarian investing, there are at least four variants. In the first, you invest in the stocks that have gone down the most over a recent period, making no attempt to be a discriminating buyer. In the second, you focus on sectors or markets that have been hard hit and try to identify individual companies in these groups that have been "undeservedly" punished. In the third, you look at companies that have taken hard hits to their market value but that you believe have underlying strengths which will help them make it back to the market's good graces. In the final approach, you buy stock in beaten up companies with the same intent (and expectations) that you have when buying deep out of the money options. You know that you will lose much of the time but when you do win, your payoff will be dramatic. If you believe that investors tend to over react to events and information, the effects of that over reaction are most likely to be seen in extreme price movements, both up and down. Thus, stocks that have gone down the most over a period are likely to be under valued and stocks that have gone up the most over a period are likely to be over valued. It follows, therefore, that if you sell short the former and buy the latter, you should be able to gain as the over reaction fades and stock prices revert back to more "normal" levels. An investor who bought the 35 biggest losers over the previous year and held for five years would have generated a cumulative abnormal return of approximately 30% over the market and about 40% relative to an investor who bought the winner portfolio. Watch out for transactions costs: There is evidence that loser portfolios are more likely to contain low priced stocks (selling for less than $5), which generate higher transactions costs and are also more likely to offer heavily skewed returns, i.e., the excess returns come from a few stocks making phenomenal returns rather than from consistent performance. 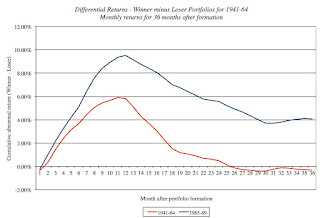 Timing is everything: Studies also seem to find loser portfolios created every December earn significantly higher returns than portfolios created every June. This suggests an interaction between this strategy and tax loss selling by investors. Since stocks that have gone down the most are likely to be sold towards the end of each tax year (which ends in December for most individuals) by investors, their prices may be pushed down by the tax loss selling. 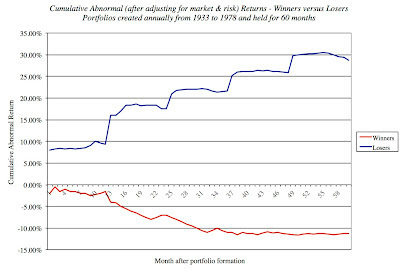 Time horizon matters: In a test of how sensitive the results were to holding period, Jegadeesh and Titman tracked the difference between winner and loser portfolios by the number of months that you held the portfolios and their findings are summarized in the figure below. There are two interesting findings in this graph. 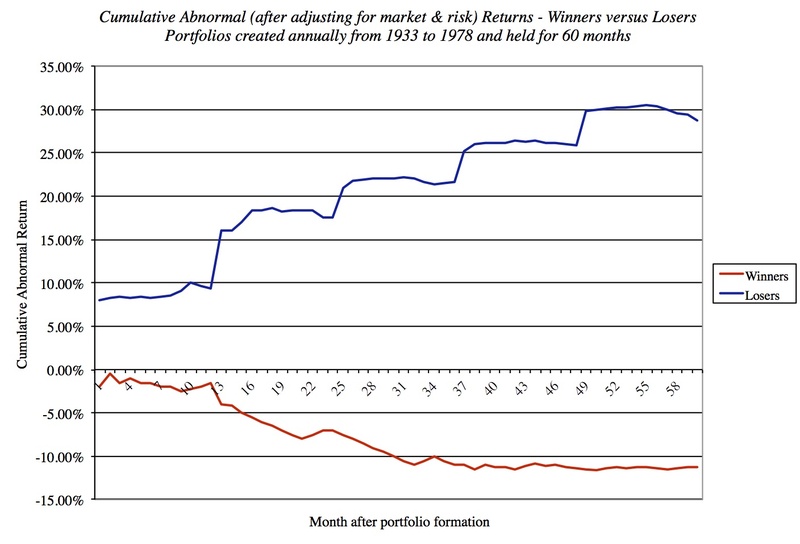 The first is that the winner portfolio actually outperforms the loser portfolio in the first 12 months. 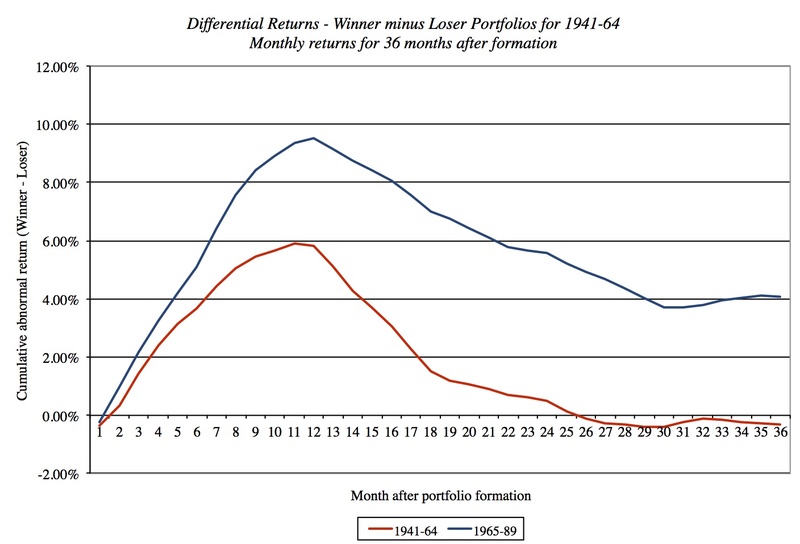 The second is that while loser stocks start gaining ground on winning stocks after 12 months, it took them 28 months in the 1941-64 time period to get ahead of them and the loser portfolio does not start outperforming the winner portfolio even with a 36-month time horizon in the 1965-89 time period. It is not uncommon for markets to turn negative on an entire sector or market at the same time. In some cases, this is justified: a big news story that affects an entire sector, or a macro economic risk that hurts a market. In others, it may represent either an over reaction by investors to the idiosyncratic problems of an individual company in a sector or a failure to consider that companies within a market/sector may have different exposures to a given macroeconomic risk. As an example of the former, consider how banking stocks were punished on the day that JP Morgan Chase reported its big trading loss. As an illustration of the latter, you can look at the Spanish stock market, where investors have punished all companies (though some are less exposed to Spanish country risk than others) over the last year. About a decade ago, I penned a paper on measuring company risk exposure to country risk that argued that we (as investors) were being sloppy in the way we assessed exposure to country risk, using the country of incorporation as the basis for measuring risk exposure. With this view of the world, US and German companies are not exposed to emerging market risk, an absurd argument when applied to companies like Coca Cola and Siemens that derive a large chunk of their revenues from emerging or risky economies. By the same token, all Brazilian companies are equally exposed to country risk, though some (such as the aircraft manufacturer, Embraer) derive most of their revenues from developed markets. This laziness in assessing country risk does provide opportunities for perceptive investors during crises. This was the case when Brazilian markets went into a tailspin in 2002, faced with the feat that Lula, then the socialist candidate, leading in the polls, would win election to lead the country. As Embraer fell along with the rest of the Brazilian market, you could have bought it at a "bargain basement" price. If you are interested in following this path, here is my suggestion. Start putting together a list of companies like Embraer, i.e., emerging market companies that have a significant global presence and then wait for a crisis in the emerging market in question. When there is one (it is not a question of whether, but when....), and your "global" company drops with the rest of the market, you are well positioned to take advantage. It is trickier, though, playing this game within a sector. Consider the JP Morgan Chase case. While the trading loss was clearly specific to JPM, you could argue that the event affected the values of all banks at two levels. The first is by increasing the chance that the Volcker rule, barring proprietary trading at banks, would be adopted, it affects future profitability at all banks. The second is the fear that in response to the loss, the regulatory authorities would require higher capital ratios be maintained at all banks. If those are your concerns, you should focus on banks that do not make have a large proprietary trading presence and are well capitalized. If investors have over reacted across the board, those banks should be trading at attractive prices. When stock prices drop precipitously for an individual stock, there is usually a reason. If the drop reflects long term, intractable problems, there may be no reversal. If the drop reflects temporary or fixable problems, you are more likely to see prices reverse. As you look at the reasons for the price drop, you should keep in mind your overriding objective, which is to find a company whose price has dropped disproportionately, relative to its value. Ingredients for a comeback: Expectations have dropped not just to realistic levels but below those levels. Investors have over adjusted. b. Corporate governance issues: Events that lay bare failures of managers and oversight by the board of directors shake investor faith and, by extension, stock prices. A case in point would be Chesapeake Energy, where the CEO, Aubrey McLendon, stepped down after evidence surfaced that the board of directors had allowed him to use $800 million in personal loans to acquire stakes in company-operated oil wells. Ingredients for a comeback: (a) A new CEO from outside the firm, (b) with a full cleaning out of management team and revamping of board of directors, and (c) an activist investor presence. c. Accounting fraud/ manipulation: As investors, we start with the presumption that financial statements, while reflecting accounting judgments that may work in the company's favor, are for the most part true. Any suggestion of accounting fraud can lead to a meltdown in the stock price, not to mention open the company up to legal jeopardy. Ingredients for a comeback: (a) Full reporting of all accounting misstatements, with (b) removal of top management, and (c) no legal jeopardy. d. Operating/Structural problems: Operating problems can range from problems with a key product (see Dendreon, on the list of biggest losers last year) to deeper structural problems, where the company's products just don't match up well to consumer demands or to the competition. Ingredients for a comeback: (a) Management that is not in denial about operating problems and (b) a realistic plan for dealing with operating problems. e. Financial problems: When operating problems combine with significant debt burdens, you have the seeds of distress, which can spiral very quickly out of control, as suppliers, employees and customers react pushing the company deeper into trouble. Ingredients for a comeback: (a) A clear debt restructuring/repayment plan, (b) Solid operating performance. 1. Is "it" a one-time or continuing problem? While the line between one-time and continuing can be a shade of grey, the answer is critical. One time problems tend to have much smaller impact on value than continuing problems, and are easier to deal with and move on. 2. How fixable is the problem? Some problems are more easily fixable than others. In making this judgment, you should look at three factors. The first is whether the problem is entirely an internal problem or whether it is partly or mostly due to outside or macro factors. Internal problems are easier to remedy than external ones. The second is whether the solution can be "quick" or will take "time". Thus, a firm with significant debt may be able to restructure that debt quickly, whereas a firm that has deep-rooted structural problems will need more time. The third is whether the managers of the firm seem to have both a reading of the problem and a solution in hand. 3. Is the market decline disproportionately large? 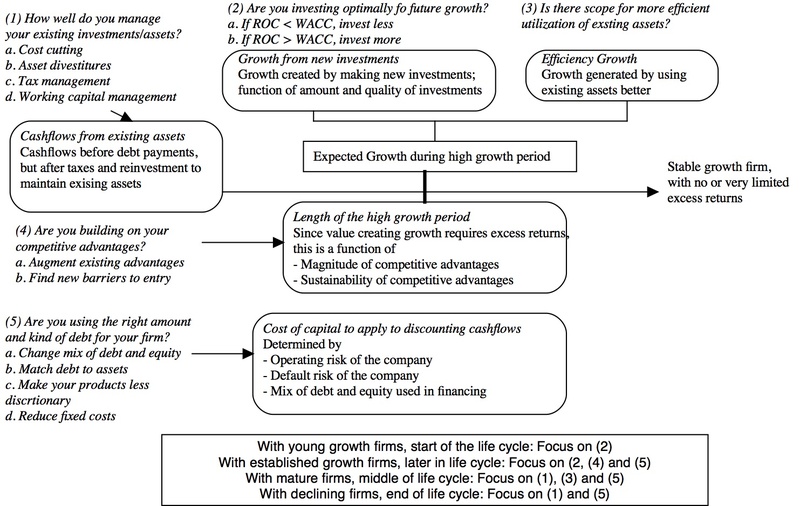 To make this assessment, you have to work through the consequences of the problem for the determinants of value: its effect on current cash flows, the expected value of growth (both the level and the quality) and the risk in future cash flows. The ROE in the most recent year for JPM, prior to its loss, was 10.34%. Even allowing for higher regulatory capital requirements (which will increase book equity) and lower profits (perhaps from the Volcker rule), the adjustment seems like an over reaction. I know that there are other fears hanging over large banks, but I have a spreadsheet that I think contains a a conservative valuation of JPM that yields a value of about $46/share, well above the current stock price of $35. You can use it to make your own judgments for JPM or any other bank. There is one final scenario: a company whose stock price has collapsed, with good reason and where a turnaround is neither anticipated nor expected. In other words, the stock looks fairly priced, given its prospects and problems today. However, let's assume that the firm has proprietary assets is in a risky business, where technology shifts could make today's winners into tomorrow's losers and vice versa. You could consider investing in this company's shares, for the same reasons that you buy an out of the money option. In effect, you are leveraging the fact that equity in a publicly traded company has a floor of zero and that your losses are therefore restricted to the prevailing market value of equity. 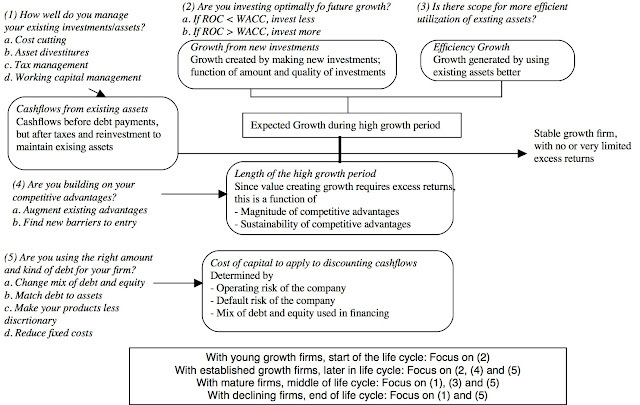 For your option (equity investment) to have a big payoff, though, you will need the value of the firm's assets to increase significantly from existing levels (because of a new product, market shift or an eager acquirer) and that will require that your firm have a proprietary technology/product/license and operate in a shifting, risky business. While the value of the assets could drop just as precipitously, you care less about downside because you don't have much to lose (since your equity value is so low). Nokia (NOK) and Research in Motion (RIM) come to mind as potential option plays. They both have proprietary technologies and patents (though the market does not think that either technology looks like a potential winner in the market today) and operate in a risky business where the landscape can shift dramatically over night. While the Blackberry technology is a more reliable cash provider for RIM, there are three factors that tip me towards Nokia. The first is Nokia's stock price has dropped far more than RIM's over a shorter period, reducing the cost of my option. The second is that Nokia's debt burden is a mixed blessing: it could cut my option game short, if Nokia defaults, but it also leverages any upside in value. Small changes in Nokia's asset value will translate into big changes in equity value. The third is that the turmoil in the Euro zone adds to the value of my option. Put differently, I like Nokia because it is riskier than RIM, but risk is my ally, not my enemy, with an option. If you plan to invest in Nokia, do so with the full recognition that you may have to write off the entire investment a few months or years from now, but if the stars align, watch out!!! As long as there have been markets, I am sure that investors have used screens to find good investments. It was Ben Graham, however, who systematized the process in his books on investing, by laying out the ten criteria (screens) that could be used to find cheap stocks. No more that two years in the prior ten, where earnings declined more than 5%. While we can debate the efficacy of these screens (I, for one, find that the fixation on net current asset value is too restrictive), it is quite clear what Graham was looking for: cheap companies with low leverage & stable and growing earnings, with liquid assets acting as a backstop and providing a margin of safety for investors. Graham had three pricing screens among his ten criteria: PE ratios, a modified version of price to book ratios and dividend yields. In the decades since, studies (many from academics but quite a few from practitioners as well) have found that at least two of these screens seem to work, at least on paper. Stocks that trade at low PE ratios and low PBV ratios deliver returns that beat the market, on a risk adjusted basis. 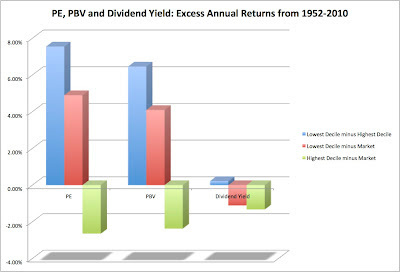 Note that low (high) PE and low (high) PBV stocks have beaten (under performed) the market by healthy margins, before adjusting for risk, over time but that there is no discernible pattern with dividend yields. In fact, over the period, non-dividend paying stocks beat both the highest dividend yield and lowest dividend yield deciles in terms of returns earned. You can find more on past studies by going to my paper on value investing. When it looks like you can make money easily, there is always a catch. Here are the three caveats on the "excess returns" that a low PE, low PBV strategy seems to deliver. Time horizon matters: The returns are in the long term (five years and longer) and there are time periods (some lasting for years) where the strategies under perform the market. For instance, looking across the entire period, for instance, it looks like while low PE stocks dominate high PE stocks over long periods, the latter group outperforms during periods of low economic growth (where growth becomes scarce). A proxy for risk? While I did not adjust for risk in my computation for excess returns, most of the studies that have looked at these screens have controlled for risk, using conventional risk and return measures (betas, Sharpe ratio etc.). It is possible that there are other risks in buying these stocks that may not be full reflected in these risk measures. For instance, some stocks that trade at low price to book value ratios have high debt burdens and run a higher risk of default/distress. Transactions costs & taxes: A lot of strategies that make money on paper perform badly in practice because they expose investors to higher transactions costs and taxes. For instance, many of the stocks in the lowest PE ratio decile are lightly traded companies, with high bid-ask spreads and potential for price impact. Similarly, investing in high dividend yield stocks may expose investors to higher taxes. In a testimonial to how difficult it is to convert paper profits to real profits, it is worth noting that the James Rea's attempts to put Graham's principles into practice in an investment fund that he ran from 1982 to the late 1990s was an abject failure, with the fund ranking in the bottom 20% of the fund universe in performance. In a similar vein, Value Line's attempts to convert its screens (that also worked exceptionally well on paper) into a mutual fund also failed. If you do buy into the effectiveness of screens at finding cheap stocks, there are two ways to incorporate screens into your investing. a. Bludgeon Screening: In this approach, all of the work in picking stocks is done by your screens. Thus, you start with a large universe of stocks and screen your way (using either more screens or tighter screens) down to a portfolio size (in terms of number of companies) that you are comfortable with. Screening plus intrinsic valuation: You value each of the screened stocks using an intrinsic valuation model (a discounted cash flow model, excess return model or your own variant) and invest in the most under valued companies. You can also incorporate a margin of safety into this approach by only investing in stocks that trade at 30%,40% or 50% discounts on your intrinsic value. Screening plus qualitative analysis: Once you have the screened list, you may be able to apply qualitative criteria that you think separate winners from losers (moats, good management etc.) to find the stocks for your portfolio. In Graham's day, screening was an arduous process, with limited access to the financial statements of companies and no computing power. Today, screening has become easy with many sites offering stock screeners for all, sometimes at no cost: Yahoo! Finance, Google Finance and MarketWatch all offer simple screening tools. In fact, it has become so easy that investors sometimes get carried away, piling on redundant screens on top of each other and sometimes undercutting their effectiveness by doing so. You want to find a mismatched company, i.e, a company that is priced low, with none of the reasons for being priced low (high risk, low growth, low quality of growth). In other words, you want a stock trading at a low multiple, with low risk, high growth rates and high quality growth. What chance do you have of finding such a bargain? It may be low, but there is no harm looking. In making these choices, you have to be consistent. If your numerator is an equity value (market capitalization, stock price), your denominator should also be an equity value (net income, earnings per share, book value of equity). If your numerator is an enterprise or overall business value (enterprise value, value of firm), your denominator should be an overall firm number (operating income, EBITDA, revenues, book value of invested capital). Should you use an equity multiple or an enterprise value multiple? In some sectors, such as financial services, you have no choice but to use equity, since defining debt is close to impossible. In others, you have a choice, and here is my simple rule. If financial leverage varies widely across the sector (some firms have more debt than others), I would go with an enterprise value multiple. For comparisons across the entire market, enterprise value multiples tend to be more robust. Once you have picked a multiple, you then have to choose your screening thresholds. In practical terms, you have to decide how low does a stock's pricing multiple has to be to qualify for your cheap list. There are three ways to find this threshold. a. You can use the rules of thumb that seem to be so widely prevalent: an EV/EBITDA less than 6 is cheap, a PE ratio in the single digits is low etc. While these rules of thumb may have made sense when first devised, it is doubtful that they make sense today. In June 2012, when the cost of equity was computed to be about 8%, the threshold for a "cheap" company would be 12.5 (=1/.08). Thus, looking for stocks with a PE less than 5 would give you stocks in the lowest decile whereas using a cut off of 10 for the PE would give you stocks in the top quartile, at least in early 2012. (a) Operating risk, reflecting the risk that your revenues and costs can shift over time, as the market and the sector evolve. (b) Financial risk, coming from the use of debt, leases and other fixed commitments that can make your residual stake as the equity investor much more volatile. (c) Liquidity risk, that you face as as investor when trading on the stock, manifested as trading costs (bid ask spreads, price impact) and inability to trade at the extreme. Price based screens: While many value investors express disdain for betas, there are other price based screens that are based upon prices (standard deviation, volatility in the stock price) that they may still be willing to use as measures of composite risk. In fact, you can use screen for liquidity risk, using market data, by looking at the bid-ask spread or the trading volume/float in a stock. Accounting based screens: Accounting statements can provide snapshots of risk, though they are stronger in measuring some types of risk than others. You can measure exposure to financial risk fairly well, using ratios that measure the capacity to make interest or debt payments (interest coverage, fixed charge coverage ratios), operating risk less well (variability in earnings over time) and liquidity risk not at all. Risk proxies: While this may be applying a broad brush, you may use the sector a firm is in as a proxy for risk; thus technology companies may be viewed as risky companies and utilities as safe companies. Alternatively, you may believe that large companies (measured in market capitalization or revenues) are safer than small companies. Sector specific screens: If you are screening for cheap stocks within a sector, you may use measures of risk that are specific to the sector. Among bank stocks, for instance, you may look at regulatory capital ratios or exposure to problem assets/businesses; banks with lower regulatory capital or greater exposure to toxic assets are riskier. While they are aggregate measures for the whole firm and accounting earnings/ book value are susceptible to accounting manipulation, you want firms that are able to earn high returns on their growth investments in your portfolio. At the minimum, the returns should exceed the costs (the cost of equity, if ROE, and the cost of capital, if ROIC). b. Sector specific measures: You can also measure efficiency of growth using sector specific measures, such as profit margins (net or operating) in retail, capital invested per subscriber (in cable or other subscriber-based businesses) or capital invested per kWh of power produced (for power companies). Once you run your screens, check the stocks that come through the screens for two potential problems. The first is sample size. If your screens return only a handful of stocks, your screens have been set too tight and you should consider relaxing one or more of your screens (settling for lower growth or higher risk). The second is sector concentration. If you end up with stocks that are in one or a couple of sectors, you may want to consider modifying or adding to your screens to get more diverse portfolios. While you can screen for free at Yahoo! Finance and Google Finance, you get far more flexibility in defining your own screens if you have access to a database. For US companies, you can try Value Line or Morningstar, both of which provide real time data for the entire universe of traded stocks and are not unreasonably priced. For screening of stocks outside the US, you can use Capital IQ, Factset or Bloomberg, but the price tag gets higher. There are some innovative sites out there that are offering better screening tools and large databases, such as RobotDough, a site that combines an impressive database with powerful screening tools, AAII and Zacks (which has a combination of free and premium screens). I have always believed that, as an investor, you need to bring something unique to the table to be able to take something away in terms of excess returns. In other words, just as we look at competitive moats for successful businesses, you have to think about your competitive moats as an investor. With screening, consider the competitive advantages that Ben Graham saw for the intelligent investor in 1951, when he put together his classic screen list. The first was access. With limited access to financial statements and no easy-to-use tools, only a few tenacious investors could use these screens. The second was discipline. Investors had to stay away from distractions and fads and stay true to those stocks that made it through the screens. The third was patience. Investors had to hold the screened stocks in the long term to generate the promised returns. Today, with widespread access to data and analysis tools , the first advantage has dissipated, leaving behind patience and discipline as your potential advantages. It can be argued that an automated screening/investing process, with no human input, is less likely to succumb to emotion than the most disciplined, patient human being. Put more bluntly, if all you have to offer as an active investor is screens, you are unlikely to beat a machine doing the same. With screening plus, whether you make money depends on the quality of what you do after you screen. If you are skilled at intrinsic valuation or qualitative assessment, you may generate excess returns, relative to the market. To illustrate the screening process, I used Capital IQ data and used two sets of screens to arrive at a list of "cheap" stocks from a universe of 7542 publicly traded companies in the US. I would not be rushing out to buy all of the stocks on either list, but I think it is worth following through and doing intrinsic valuations of these companies. Anyone up for it? If so, you are welcome to use my generic valuation spreadsheet. 1. Would you classify yourself as a "value investor"? 2. If yes, what makes you a value investor? d. I don't know. I just am. 3. Finally, do you think that value investors collectively do better than other investors in the market? If yes, what is the source of their advantage? If not, why do you think they fail? On the first question, I would not be surprised if the preponderance of visitor to this site classify themselves as value investors. After all, value investing has become so broadly defined that everyone seems to be in this camp, and when everyone is a value investor, no one is a value investor. For value investing to work as an investment philosophy, it needs foils, preferably in the form of investors who know little about fundamentals and care about them even less. Paraphrasing Warren Buffett, if investing is a game of poker and value investors are the card counters, you need suckers at the table who will supply the winnings. On the second question, as value investing has expanded well beyond the Ben Graham school of strict (and passive) value investing to include different and seemingly contradictory strands of investing, there is less consensus about what comprises a good "value” stock. In a recent paper on value investing (which, in turn, is closely modeled on a chapter in my book on investment philosophies), I presented my take on these issues. On the third question, it does seem to be taken for granted, at least in the value investing community, that value investors are not only more virtuous than other, more fickle investors (growth investors, momentum investors) but that their "hard work" pays off in the form of higher returns, at least over long periods. It would be vindication of the "ant and the grasshopper" fable, if it were true, but is it? What is the key characteristic that separates value investors from the rest of the world? In my view of the world, and I understand that yours might be different, the key to understanding value investing comes from breaking down a business into assets in place and growth assets. It is this mechanism that I used to my posts on estimating how much you are paying for growth and how much that growth is worth. If you are a value investor, you make your investment judgments, based upon the value of assets in place and consider growth assets to be speculative and inherently an unreliable basis for investing. Put bluntly, if you are a value investor, you want to buy a business only if it trades at less than the value of the assets in place and view growth, if it happens, as icing on the cake. a. Passive value investing: The oldest strand of value investing traces its lineage back to Ben Graham and his use of screens to find cheap stocks. Reviewing those screens, which combine market and accounting data, from Graham's book on security analysis, you are looking at stocks that trade at low multiples of earnings, pay a high proportion of these earnings as dividends and have a high proportion of assets that can be liquidated for close to their book value. In the years since, investors have added other screens (good management, stable earnings, strong competitive advantages etc.) that are all designed to reduce the potential for downside on the investment. b. Contrarian value investing: In contrarian value investing, you adopt a different tack. You look for companies whose stock prices have collapsed for one reason on another. In its least sophisticated variant, you just buy the biggest losers (at least in terms of stock price), on the assumption that markets generally over react and that the portfolio of these losers will bounce back over time. In its more refined forms, you add other criteria to the mix. Thus, you may buy stocks that have gone down but only if they have a strong brand name and/or little debt. c. Activist value investing: In activist value investing, you focus on poorly performing companies and look at the value of its assets in place, with better management in place. You then try to change the way the company is run by either acquiring control of the firm or putting pressure on existing management. Activist investing requires far more resources than either passive or contrarian value investing. The skills and strengths you need to succeed in each of these value investing approaches is different and it is not clear than an investor who succeeds using one strand of value investing will be comfortable with the others. In the next three posts, I will focus on each of these strands of value investing. In the last post, I will examine the most contentious issue of all, which is whether value investors collectively generate value from their efforts or whether this too is "fool's gold".